The hostel is mainly for backpacking travelers and city persons who wish to visit the island of Chiloe. We provide breakfast & Wi-Fi Internet. 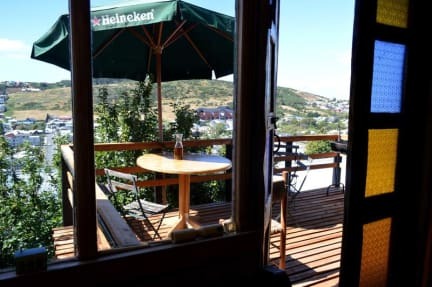 Submarino Amarillo Hostel offers relaxed & friendly atmosphere of the great island of Chiloe. Submarino Amarillo Hostell is located on a long road in a calm residential area of the city. It is situated one block from the Municipal Bus Terminal. Submarino Amarillo Hostel offers single, double and shared dorm rooms with beautiful views of the city. Also, you will find there kitchen area which is connected to the lounge. There are 3 bathrooms located at different locations of the hostel. We have 13 beds in total of which 11 are for single personas and the other 2 are for 2 persons. Guests have access to a patio/balcony and garden. Our clients must be 18 years of age. Children younger than 18 years must be accompanied with an adult. Amazing place, super familiar, great atmosphere. Just perfect for celebrating my birthday. Everybody was trying to give me a great time! Besides, Cristian and Ignacio are just like friends! They accompany all the tours (really recommending the curanto! 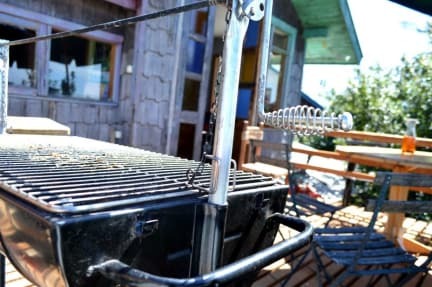 ), they go out for a beer with you, they do barbecues in the terrace,...just great. Also, beds are very big and comfy, breakfast is fine. It's clean and the place itself very artsy. Amazing value for money, especially compared to hostels in Castro. Ein wundervolles Hostel mit bester Lage zum Busbahnhof (5min zu Fuß), einem traumhaften Blick von der Terrasse aus, einer einladenden und gut ausgestatteter Küche und geräumigen Schlafzimmern. Safes sind vorhanden, die Bäder und sauber und das Wasser wird warm. Das Frühstück beinhaltet Kaffee oder Tee, Toast, Marmelade, Butter, Wurst, Käse und einer chilenischen Süßigkeit aus Crackern und dulce de leche. Beste Gastfreundlichkeit inklusive. Great hostel to stay in in Ancud. Although it's not extremely well located, the owner Christian makes up for this with his friendly attitude. In addition, the kitchen is well equipped, good breakfast and very clean everywhere. However, we spoke no Spanish and it was a bit of a difficulty to communicate and take part in small talk as nobody spoke English. We stayed in Submarino Amarillo Hostel for two nights and definetly wish that we could've stayed longer! Cristian and his Crew really know how to create a cosy and relaxed atmosphere - it feels like coming home to join your family=). They can as well help you to book tours around Ancud and will always be there to answer questions or just have a little chat. The common areas are clean and bright, the view from the terrace is beautiful! We defintely recommend that place!!! haus super gemütlich, zimmer geräumig, ausreichend bäder, küche super ausgestattet, alles super sauber. besitzer total entspannt und sehr hilfsbereit. man fühlt sich direkt wie zu hause. alle 3 terminals fußläufig zu erreichen, wie auch das zentrum. einfach top! This Theme-Hostel is so cute. I liked the detailes in there. Sadly I could not stay longer.